Brussels: The European Union urged Britain to decide what it wants from Brexit on Tuesday, after lawmakers massively rejected a divorce deal that took two years to negotiate. Frustrated EU leaders insisted the accord they signed with Prime Minister Theresa May in November remains the best way to avoid a feared “hard Brexit” on March 29. And they warned the bloc would remain united if May now comes seeking more concessions to help her sell the accord to sceptical British MPs and voters. “It’s now up to the British government to say what the next stage is. The EU will remain united and determined to find a deal,” chief negotiator Michel Barnier said. Donald Tusk, who as president of the European Council represents member states, consulted the remaining 27 EU capitals and expressed much the same view. “We regret the outcome of the vote and urge the UK government to clarify its intentions with respect to its next steps as soon as possible,” his spokesman said. “The EU27 will remain united... and will seek to reduce the damage caused by Brexit,” and, in a more personal tweet, he implied that Britain should stay in the union. Austrian President Sebastian Kurz, who said he had spoken to Barnier after the vote, said the union would work hard to avoid a “hard Brexit”. Spanish premier Pedro Sanchez, who is due to address the European Parliament on Wednesday, also insisted the agreement on the table is the “best possible”. “An unordered exit would be negative for the EU and catastrophic for the UK,” he said. The head of the EU executive arm, Commission president Jean-Claude Juncker, warned that the British decision had increased the risk of a “no deal” Brexit. If London does not ratify an accord before March 29, it will leave owing billions in EU dues and with no transitional arrangement to keep trade flowing. 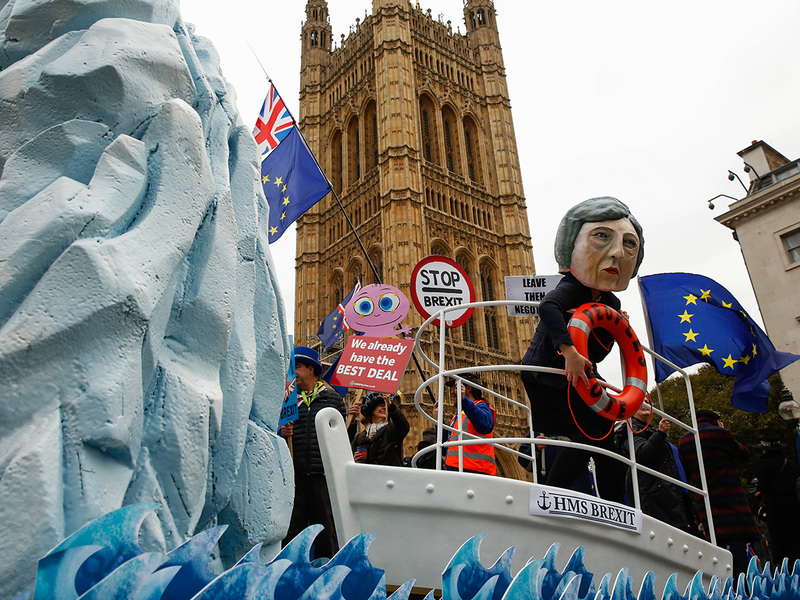 But May’s Conservatives are split between supporters: hardliners who want an abrupt split and pro-Europeans who want to re-run the 2016 Brexit referendum. The main opposition Labour Party, meanwhile, is also divided and its leader Jeremy Corbyn is trying to use the crisis to topple May and force a general election. Time, however, is short and there in no appetite in Brussels to re-open the laborious two-year negotiation that led to the deal that May failed to sell to MPs. “I urge the United Kingdom to clarify its intentions as soon as possible. Time is almost up,” Juncker said. Juncker stressed the European parliament will press on to ratify the agreement, while making preparations to handle the economic fallout of a “no deal”. “The Withdrawal Agreement is a fair compromise and the best possible deal,” Juncker insisted. “It reduces the damage caused by Brexit for citizens and businesses across Europe. It is the only way to ensure an orderly withdrawal of the United Kingdom. “The risk of a disorderly withdrawal of the United Kingdom has increased with this evening’s vote, he said.